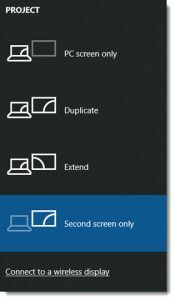 The Windows 10 Notification Pane is often overlooked – and depending on the computer settings, the number of notifications it creates can be annoying and definitely lend to it being ignored (for reference, TLC Creative computers have the majority of notifications turned off!). Click the notifications icon in the lower right of the task bar to view. 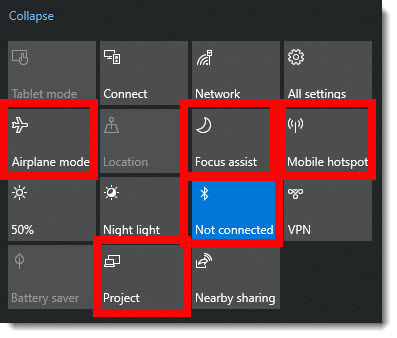 The Notification Pane opens (thankfully I have no actual notifications) AND shortcuts to several Windows 10 features. So the real use of the Notification Pane is to easily turn on/off features or open their options. Airplane mode is just like on your phone, WiFi – Bluetooth – and other features are all turned on or off with a single click. We run Airplane mode note only when flying, but often on our show computers where we do not want anything interfering with that computer displaying presentation graphics to the world. Project is just another way to open the video output selection pane, it is the same as Windows + P (for Projection). 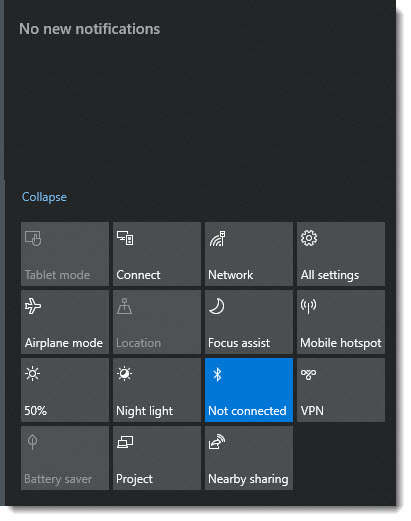 Mobile hotspot is one of the best features of Windows 10. Easily share that computers internet with other devices – and the internet connection can be wired or wireless that it shares! Focus Assist is new, and it has some great features for presenters. Stay tuned, this feature has its own blog post this month. Bluetooth is used a lot, mostly to turn it back on after clicking the Airplane mode button and wanting my Bluetooth mouse back!